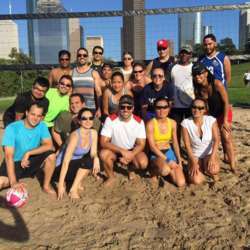 You must be a member of the Houston Volleyball Group to attend this activity. Would you like to join this group? Bummer, court is wet due to last night’s rain. We will NOT play today. Rescheduled for another day. Hey pretty people!! What could be more fun than getting a few games in at this beautiful scenic sand court. We’re playing at the court located along Buffalo Bayou at Sabine and Allen Parkway. There are paid parking along the side of the road. Or free parking near the Lee & Jamal Skate Park. New to this? No problem. All levels welcome! Please bring sunscreen, water, music & friends! See you at the sand court!